Animal populations fluctuate from year to year and every once in a while a particular species will show up in great abundance. 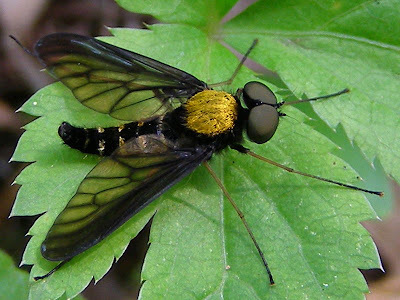 Whatever regulates the population size of the Golden-backed Snipe Fly, Chrysopilus thoracicus, has worked to produce this insect in record numbers this year. I can’t remember ever seeing these flies in numbers as great as they are right now. This is a male. The most noticeable male trait is a set of enormous eyes. In fact, the head doesn’t seem to be anything but eyes. 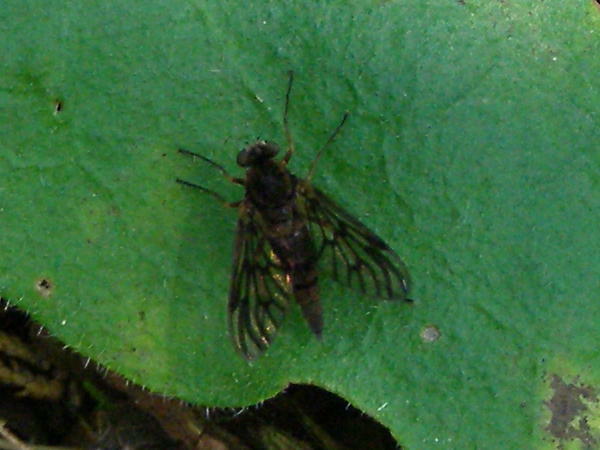 The males also display a tapering, up curved abdomen. 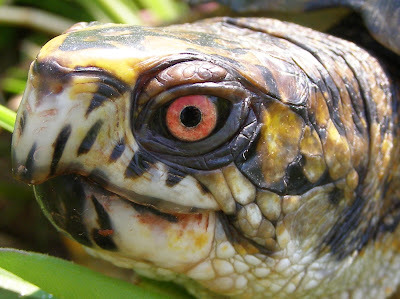 The eyes of the female are much smaller. 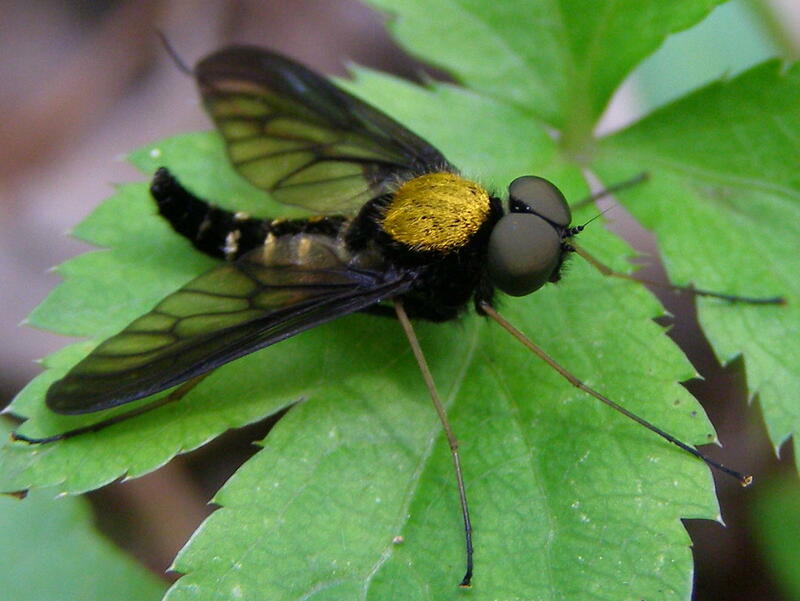 This makes me think that the large eyes of the male must be used to find females. If the large eyes were necessary for searching for food or watching for predators, both sexes should have them. The abdomen of the female is also wider and doesn’t really taper until it reaches the end. Both sexes display the bright yellow spot on the thorax. 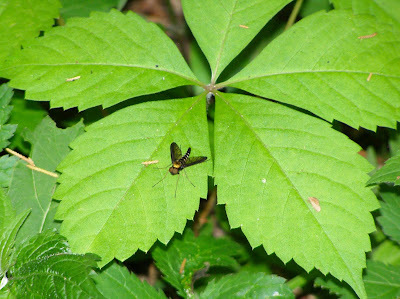 This fly seems to spend a lot of time sitting on top of low growing vegetation. They tend to stay in the shadows in low lying areas near creeks or drainage ways. 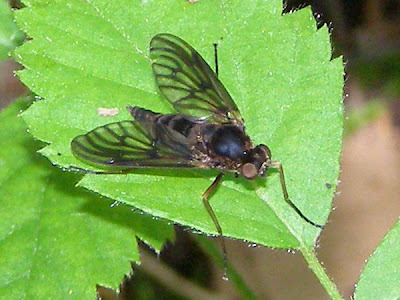 They’re usually easy to spot and when disturbed normally only fly a short distance. There’s more than one species of Snipe Fly lurking in the shadows. 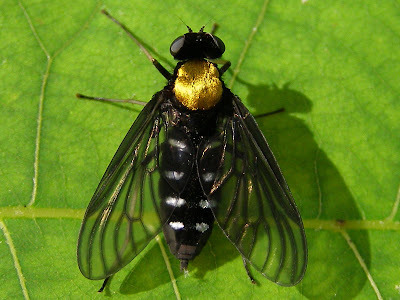 When I first saw this fly, I thought it might have just worn off its golden spot. A closer look quickly proved that assumption to be wrong. I don’t know what species this. The coloration really makes the wing veins stand out. The keys probably don’t even talk about wing vein patterns. Yesterday was definitely a turtle day. Wild strawberries are ripening in the fields and the turtles are out to stuff themselves while the bounty lasts. The red scraps around this guy’s mouth are indications that he’s already had a few of the tasty berries. 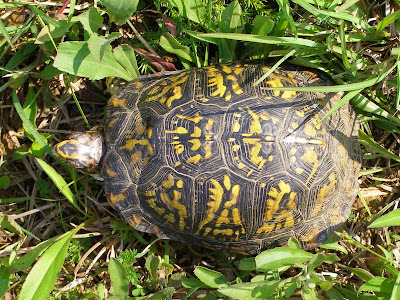 During hot weather, the turtles are most active in the mornings and evenings. 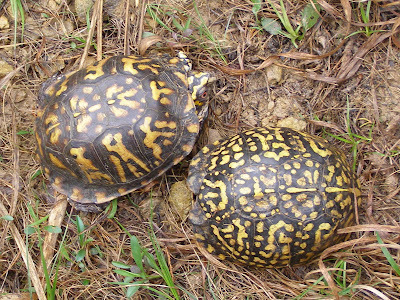 Strawberry time provides an excellent opportunity to see turtles. 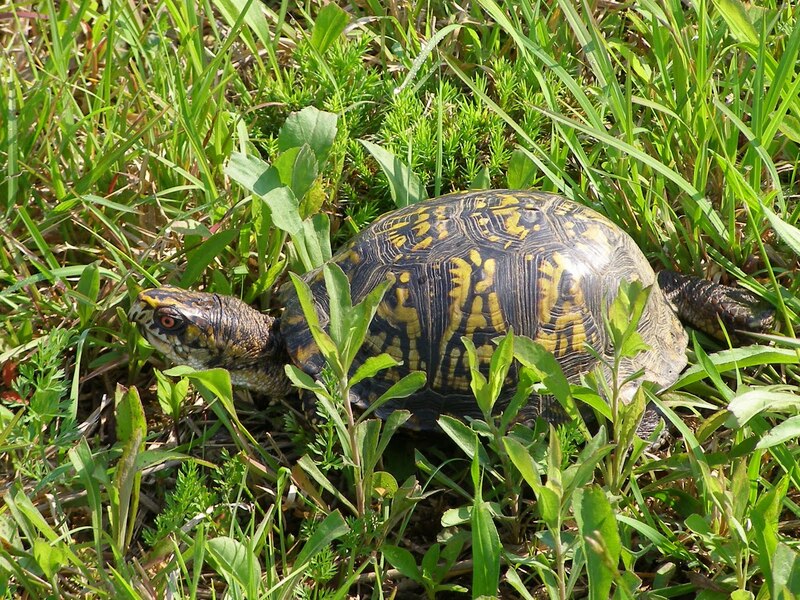 If you don’t see them outright, you can often find them by watching for the plant tops to quiver as the turtle walks by or hearing them crunch through last year’s dead grass stalks. I take an aerial view of each turtle I find. 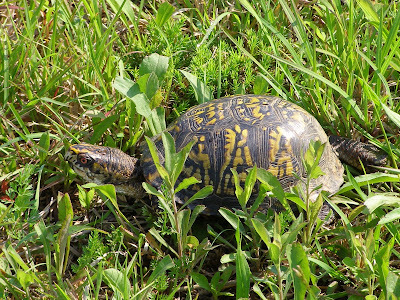 Since I don’t record the location of each turtle, the photo record doesn’t provide any scientific data concerning turtle movement around the property, but it does show that there are or have been a lot of individual turtles here. 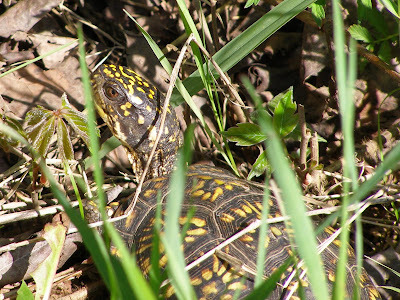 It didn’t take long to run across a second turtle. This one was in a hurry and hardly slowed down for a picture. The strawberries don’t last very long, so the turtles have to be quick about collecting them. In the next field I found this male and female. It’s a little late in the season for breeding activity. Maybe they were just comparing notes on the most likely place to find strawberries. I had a few minutes yesterday evening to walk back to the creek and see what was blooming. The nasty storms that came through the county last weekend missed us by several miles, so the creek didn’t flood. I’m glad. A flood this time of year really messes up the flower display. 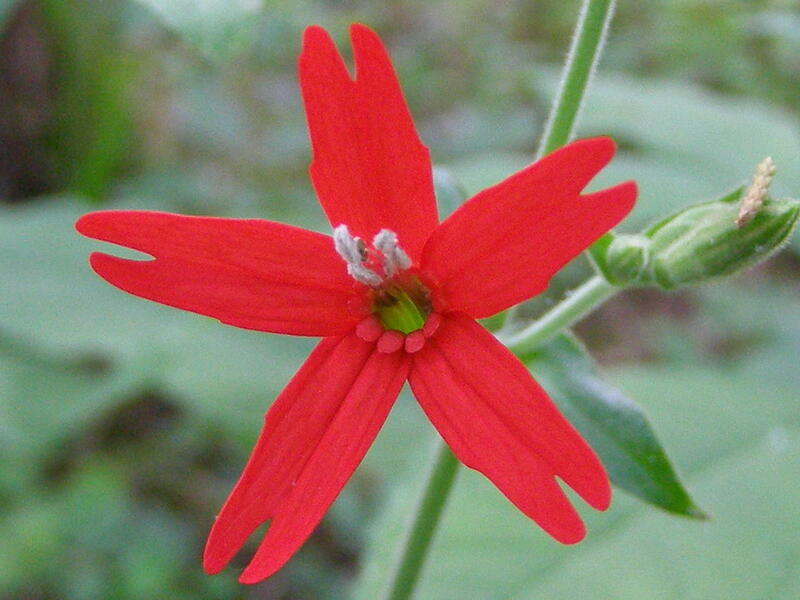 Fire Pink, Silene virginica, is just beginning to bloom. The red is so vibrant that it almost looks to be an artificial addition to the photo. Blue Jay Barrens is located in the upper reaches of the watershed, so the floodplain is not typical of what most people imagine. It’s rare to have a rain intense enough to bring the water very far beyond the creek bank. When we do have a heavy rain, the flood event is extremely violent and only hours or sometimes minutes in duration. 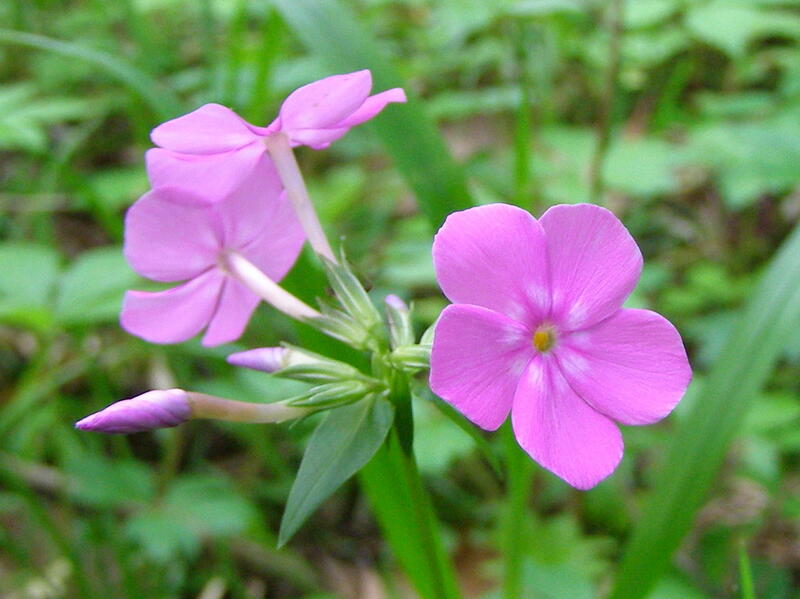 Smooth Phlox, Phlox glaberrima, doesn’t stand up to flood water. I think the pastel pink of the flower makes it the most beautiful of the phloxes. 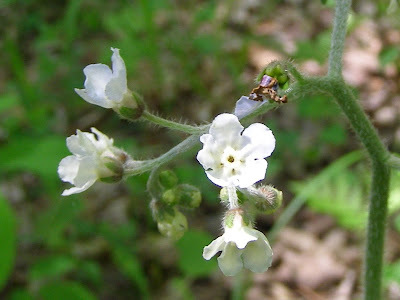 This is one of the last of the Wild Comfrey, Cynoglossum virginianum, plants to bloom. When the hairy leaves begin to emerge early in the spring, I always think Common Mullein. That’s just a fleeting thought, though after seeing these plants in the same location for 25 years you would think I would just forget about mullein. These neat little petals are fused at the base and fall as a single unit after the flower is pollinated. The dropped blossoms look like party hats dropped by a crowd of New Year’s Eve revelers. 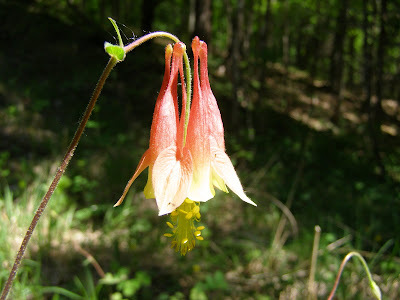 Wild Columbine, Aquilegia canadensis, is about at its peak right now. The floodplain soils are deep and well drained, with adequate moisture to growing conditions perfect for plants like this. 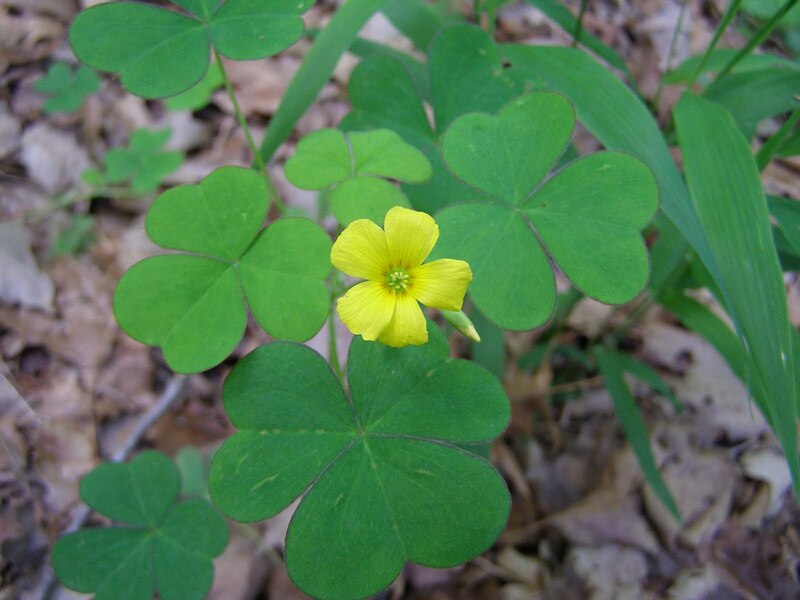 Great Wood Sorrel, Oxalis grandis, grows in the part of the floodplain that is least likely to sustain flood damage. 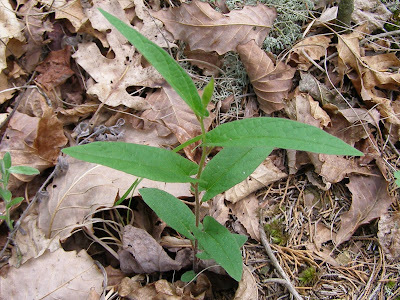 This plant can get to be over two feet tall with leaves that stretch to two inches across. The yellow flower seems to be favored by butterflies and other insects. The leaves have a soft purple edge that almost seems fluorescent at times. I’m busily working to finish spraying the woody regrowth marked by red flags. I try to get the spraying done by the end of May, because at some point in June the vegetation will overtop the flags and they will be lost. This has been a tough year to get things sprayed. 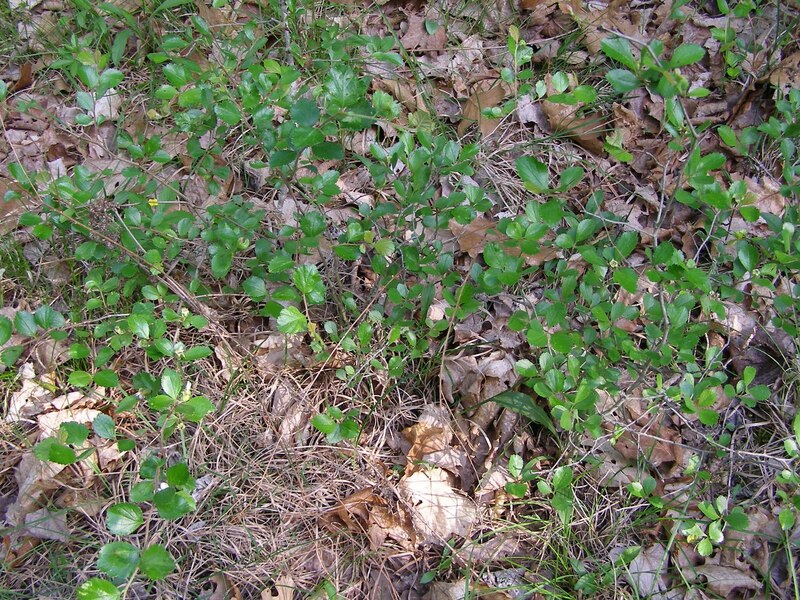 April was dry, but most of the shrubs had not begun to grow. Most days in May have been either rainy or windy. After spraying all the flags in this corner of the field, I looked back to enjoy the flag-free view and saw, right where I had been standing a few minutes earlier, a flag I missed. Black Walnut can be tricky. They don’t begin to grow until late in the spring and then they suddenly grow at a rate of inches per day. It they do get too tall, I’ll trim them back to avoid having to spray too large of an area. Tuliptree sprouts can be difficult to spray. 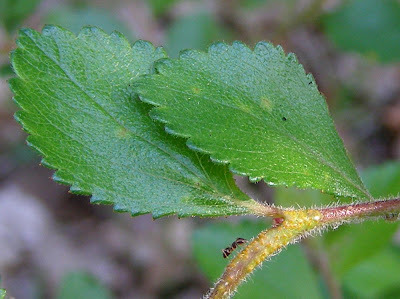 The leaves are typically held vertically, so the spray has to come at them from the side. They also have a heavy wax coating on the leaves that can cause the spray to bead up and roll off. This requires a surfactant be added to the spray mix that erodes the wax layer and allows the herbicide to spread out and adhere to the leaf surface. Ash sprouts are another that puts on a sudden burst of growth. The sprout first produces a cluster of large simple leaves and then begins to develop the typical compound leaves. 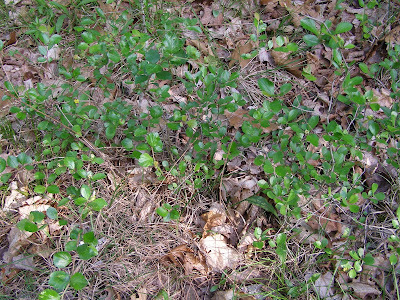 The ideal time to spray is just before the compound leaves appear. 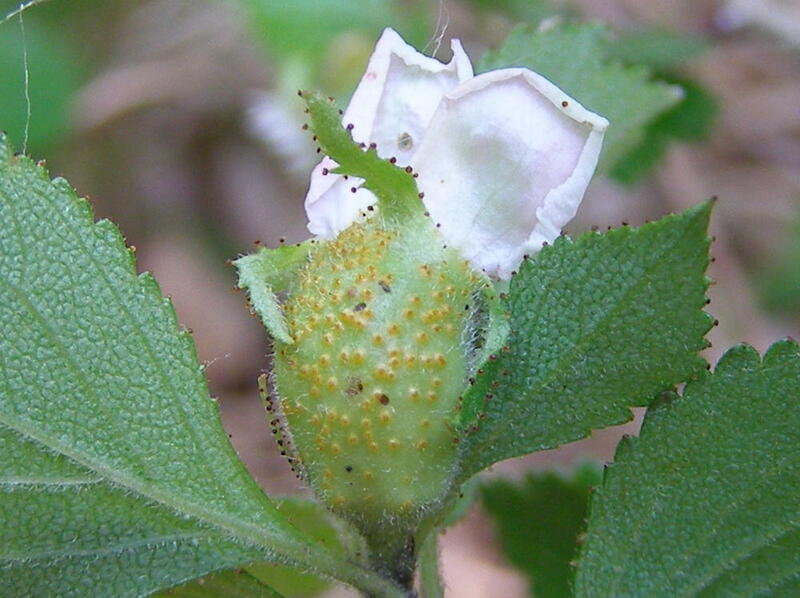 At that time, the plant is very short and the simple leaves have a lot of surface area to receive the spray. Spraying a compound leaf is difficult because there is too much open space between the leaflets and spray easily gets onto non-target plants. If compound leaves are already being developed, I normally clip off the top of the ash before spraying. Redbuds normally begin growth a little earlier in the season, but the early growth got hit by a late frost and died back. I had to wait for it to regrow enough to spray. By the time I finish spraying, I’ll have averaged three visits per flag, checking on its readiness to receive spray. This year I had about 1600 flags spread out over 12 acres, so the job of spraying allowed me to do a lot of walking. Autumn Olive got a double spraying this year. They are early growers and typically get the earliest spray application. I’ve found that the larger shrubs will try to regrow after the initial die back. I left the flags in place after the first spraying and am now giving the resprouts a second shot. I’ll keep a watch to see if this method is more successful. This Low Bindweed, Calystegia spithamaea, has a flower that everyone recognizes as belonging to the Mourning Glory Family. Now I can hear some of you groaning and saying “Here’s another poor plant he’s going to stomp, cut, pull or spray.” Well, despite the fact that it is a weed by common name and belongs to a family known for containing some of the most aggressive weeds around, this is a native plant that is welcome and protected at Blue Jay Barrens. 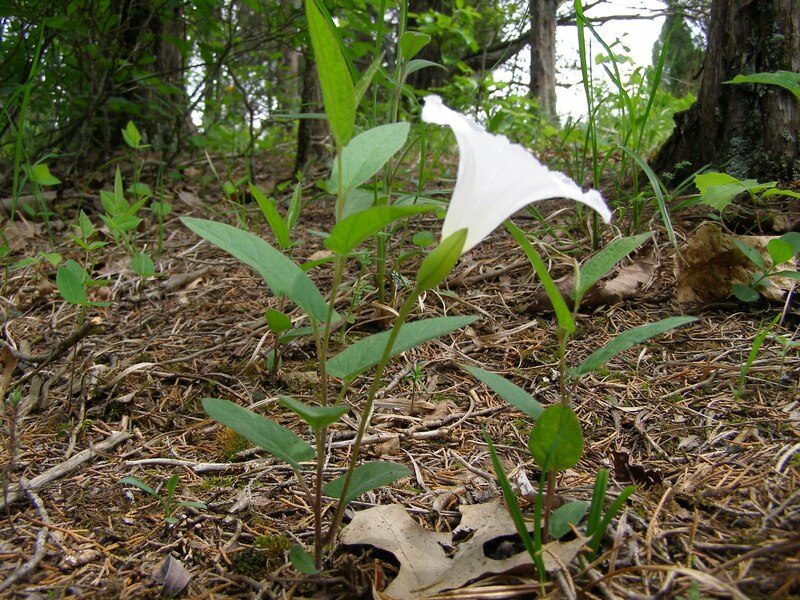 As the name suggests, this low growing plant rarely exceeds a foot in height. 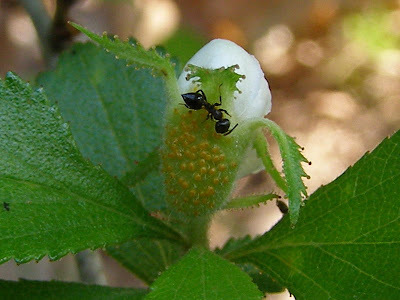 The flowers, which at casual glance appear to be located near the top of the plant, are carried aloft by long stems originating from the lower leaf axils. Plants very seldom have more than a single flower. The five parted nature of the flower is easy to see. The divisions between the five lobes almost appear to be perforated. Lines through the center of each lobe form a five pointed star. Low Bindweed is a perennial that primarily grows in dry rocky sites like you find on the barrens. It seems to be a peak year for this plant, possibly because of the extremely rainy May we’ve had. Weather conditions definitely play a part in plant development, but it’s not always clear what types and timing of weather conditions produce what effects. For some plants it’s the previous year’s weather that determines the current year’s growth. Most of the plants have not produced any bloom. 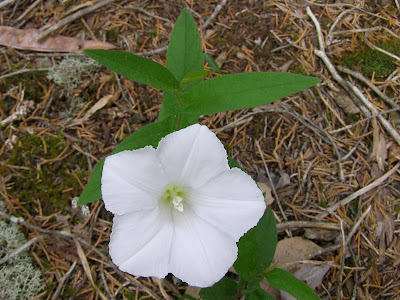 Many plants on the barrens take several years to mature to the point where they can produce a flower. 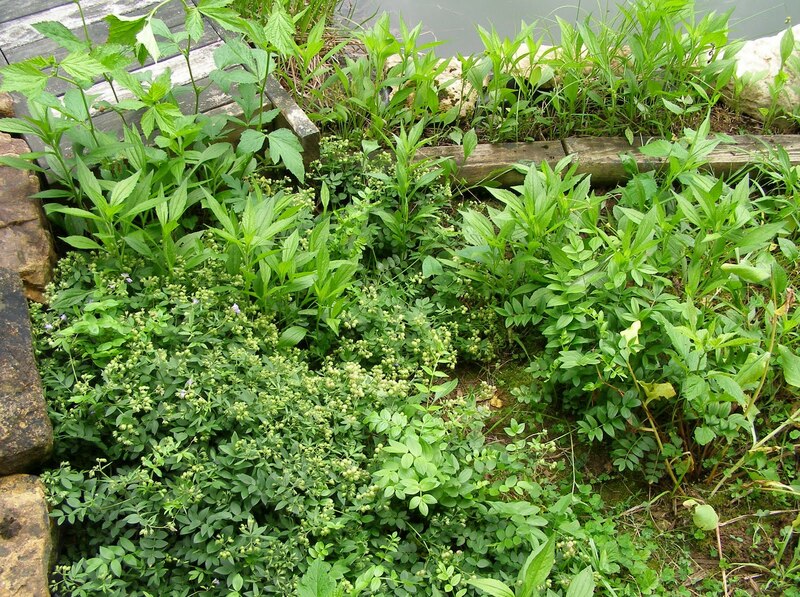 It’s also common for mature plants to skip a year or two after flowering. 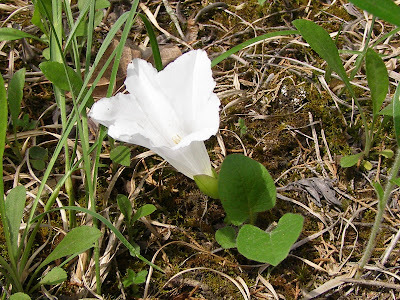 Some of the Low Bindweed plants are low to the extreme. This plant seems to have been nipped off by something. Since the flower originates from the lowest part of the plant, blooming was still possible. Loss of so many leaves will reduce this plant’s ability to produce and store energy for winter survival and spring growth. Different species of plants respond differently to this type of stress. Some will abort seed production in favor of keeping the plant alive. Others will put all energy into seed production in an effort to perpetuate the species by producing offspring. I don’t know if these responses are species specific or if they are the result of a certain set of environmental conditions. I was on a naturalist led hike about 25 years ago and commented on Oxeye Daisy growing in one of the Ohio barrens. I was told that it wasn’t a concern because it just filled in the voids and didn’t seem to be displacing any of the native flora. I think we’ve now learned that to be an inaccurate observation. This field is not one that you would consider to have voids. What it had was an opportunity for this aggressive early season plant to establish itself before the warm season prairie species began to grow. Oxeye Daisy does have a nice flower and many people welcome it into their fields for that reason. 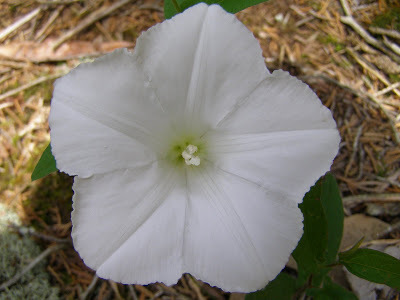 This is the one flower that I told my kids they could pick at any time without asking. Picking obviously didn’t slow down the spread. Each flower head will produce many hundreds of seeds, all of which easily produce new plants. Besides being an excellent seed producer, Oxeye Daisy is a perennial that can spread by the production of rhizomes. 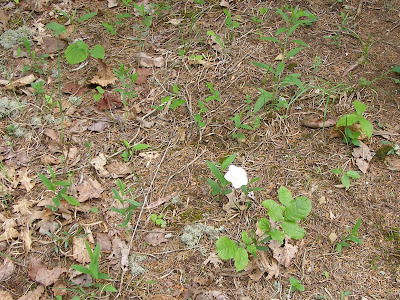 Once a plant is established, it proceeds to expand into the surrounding areas. The plant is easily pulled because of its shallow root system, but any rhizome pieces left in the soil quickly produce new plants. This is going to be a tough plant to deal with. Spraying won’t work because too many other plants would be affected. Pulling, if you had the time and manpower for the job, would not work because you would always be leaving bits of rhizome to grow back. 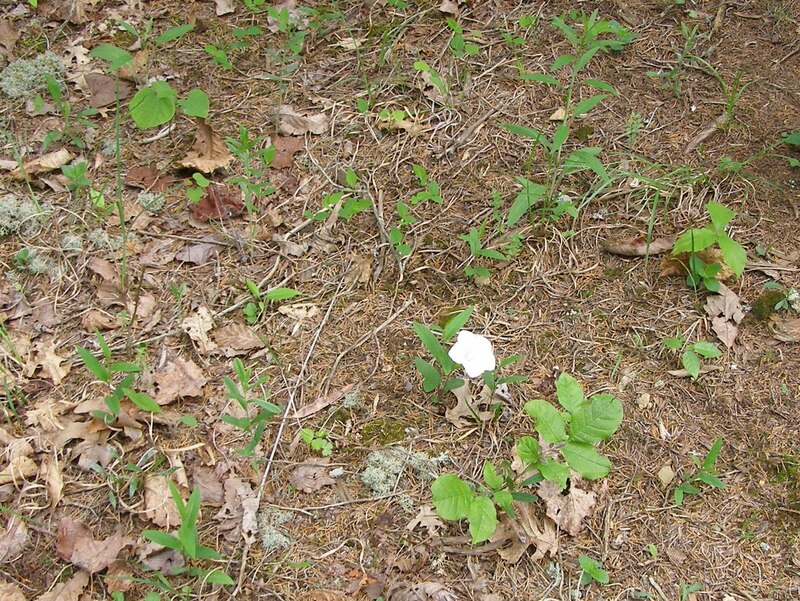 Mowing during the growing season would probably favor Oxeye Daisy, because it easily grows back from the basal stems. Goats would favor the Oxeye Daisy over most early growing plants and could reduce the number of plants over time. Maybe I’ll get a couple of goats and let them work on the areas of worst infestation. I guess I’ll have to find time in my schedule to try out a few control strategies on this newest invader. I don’t know of any faces that have more character than those of old reptiles and amphibians. This Eastern Toad’s face has that look of wisdom that only age can bring. He showed up two nights ago and has been singing almost nonstop. Unfortunately, he’s alone in the Water Garden. 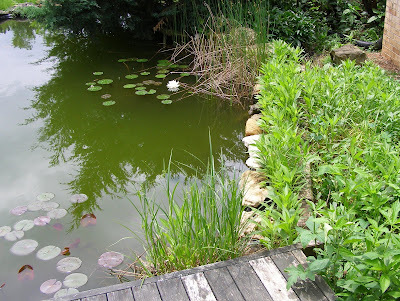 There were some toads singing in the pond a few weeks ago, but I haven’t heard them recently. As far as I can tell, this is the only toad in the vicinity with breeding on his mind. He looks very much like an ornament. He wouldn’t sing while I was near with the camera. Other than that, he totally ignored my presence. Maybe his efforts will attract a female that hasn’t already laid her eggs. The number of breeding toads at Blue Jay Barrens has been falling steadily for several years. By next breeding season I’ll have the first of my series of toad pools ready for use. Maybe that will help the population rebound. Toads don’t get much wartier than this. Toxins produced in the skin and the two large glands just behind the eyes discourage predators from making a meal of the toad. A second line of defense, known to little boys everywhere, is peeing on the assailant. I always feel bad about scaring a toad into peeing, because that water could sustain the toad’s life if forced to endure a drought. Toads haven’t yet disappeared completely. I still encounter them regularly as I walk. My desire to increase toad numbers is primarily spurred by the need to have a healthy toad population in order to sustain the Hognose Snakes, predators that specialize in toads. The snakes are here and I’d like to do what I can to keep them healthy. Toads seem to love attention, but it helps when you offer a warm hand on a cool morning. The Eastern Toad can be distinguished from the similar looking Fowler’s Toad by spotting on the ventral surface. Following the photo shoot, the toad snuggled down to get warm. I gave it about 30 seconds and then sent it on its way. It’s bloom time for the Dwarf Hawthorn, Crataegus uniflora, so I made a point of getting out to look at it yesterday. 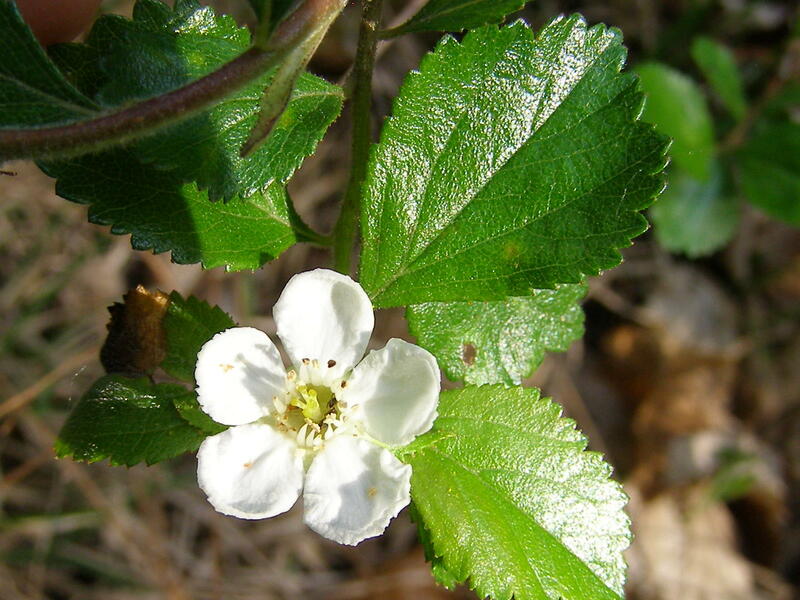 There were several blooms along with some unopened buds and developing fruit. The plants looked in good shape. 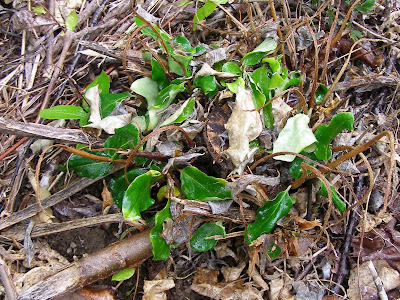 The leaves were a dark glossy green and there was very little dead wood in the plants. Dwarf Hawthorn is rare in Ohio, so I monitor it closely through the year. I saw a bud with some yellow bumps and since the yellow spots were being tended by an ant, thought they were probably yellow aphids. A closer examination proved that assumption to be false. The yellow bumps were a deformity on the plant itself. A second bud showed the same spotting. At this point I suspected the plants were displaying signs of Hawthorn Cedar Rust, a fungus with a life cycle like the Apple Cedar Rust I talked about a few weeks ago. However, HCR is most commonly found on the stems and leaves and those looked fine. Well, maybe they’re not as fine as I first thought. Here are some signs on the stem and the leaves are showing just a hint of spotting. The yellow eruptions are the site of spore release for the fungus. There must also be something present that is of value to the ants. 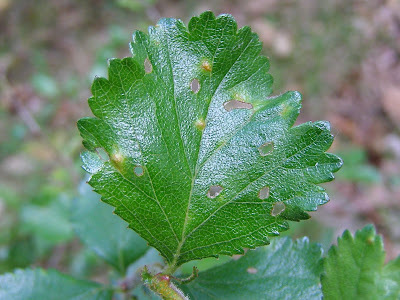 Here’s a leaf showing development of the fungus galls. Other species of Hawthorn at Blue Jay Barrens display signs of the fungus every year and manage to survive and grow. It’s extremely disappointing to have such a rare plant infected with the disease. Maybe it’s the unusually wet spring that is to blame for this infection and things will get back to normal the next dry year. I’ll just have to watch and see what happens. Since we had a night time visit to the Water Garden yesterday, I thought it appropriate to take a look during the daylight hours. The tornadoes, hail and heavy rains missed us by about 10 miles Friday night. We got about an inch and a half of rain. Just enough to freshen the Water Garden and water all the plants. Most of the plants are natives that came up on their own. I do a little bit of weeding and trimming, but the plants are mostly maintenance free. 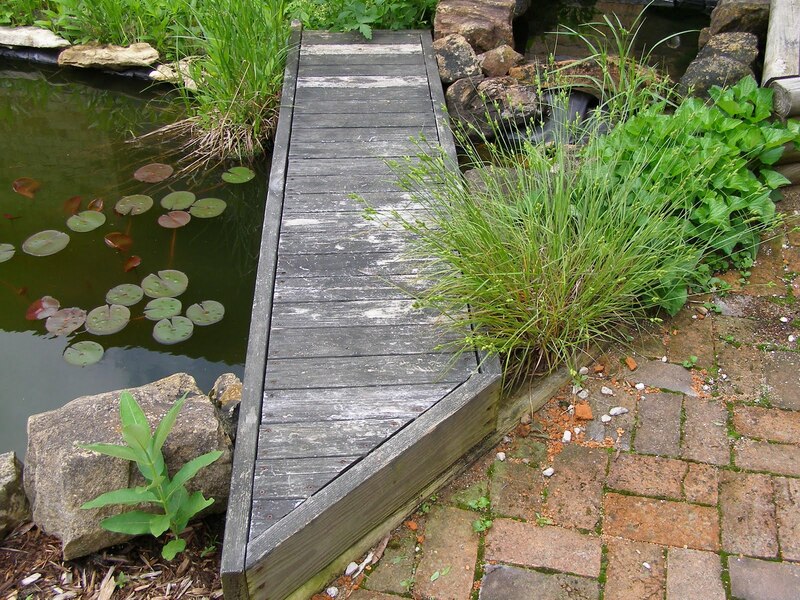 The bridge is used to get to the area between the Water Garden and the house. 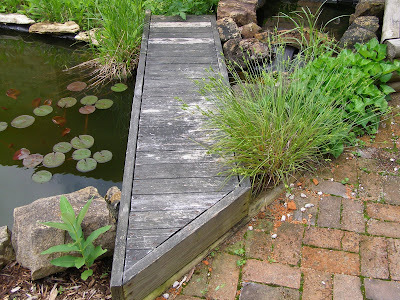 At my daughter’s request, the bridge and pool were designed so we could sit and hang our legs in the water. 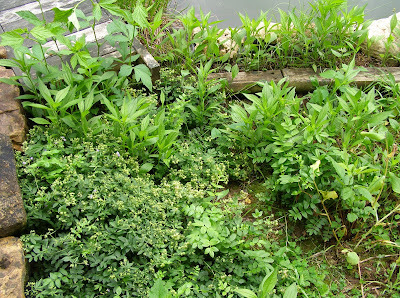 The milkweed to the left of the bridge showed up last year. I’m hoping a Monarch butterfly places a couple of eggs there this summer so I can watch the caterpillars develop. 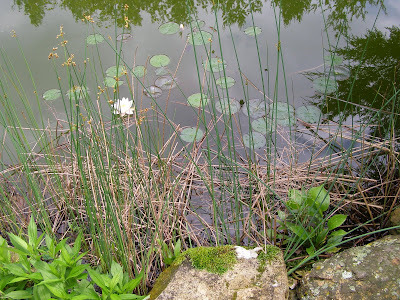 Violets, Dark-green Bulrush and Small-flowered Water Plantain all crowd the spillway that delivers fresh rain water into the large pool. 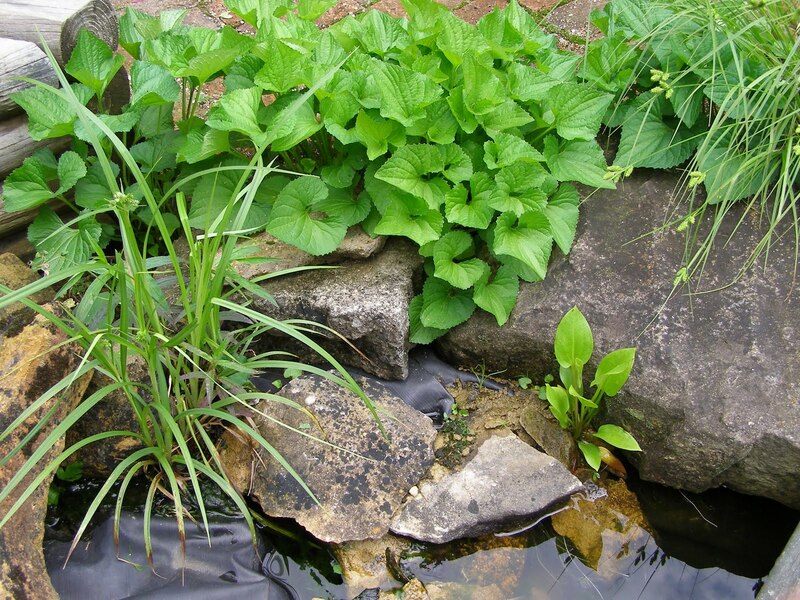 As the Water Garden ages, small pockets and folds in the liner collect debris that supports root growth. 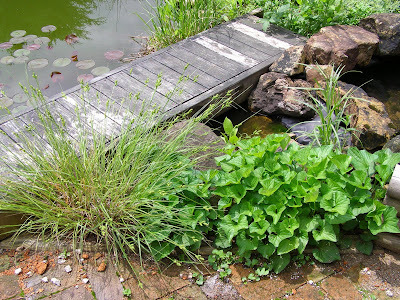 Plants are no longer restricted to my submerged pots. This began as a pot of Dark-green Bulrush. Several additional species now share the pot and the vegetation mat has bridged the gap between the pot and the side of the pool. The area between the pool and the house is 70 percent native plants. 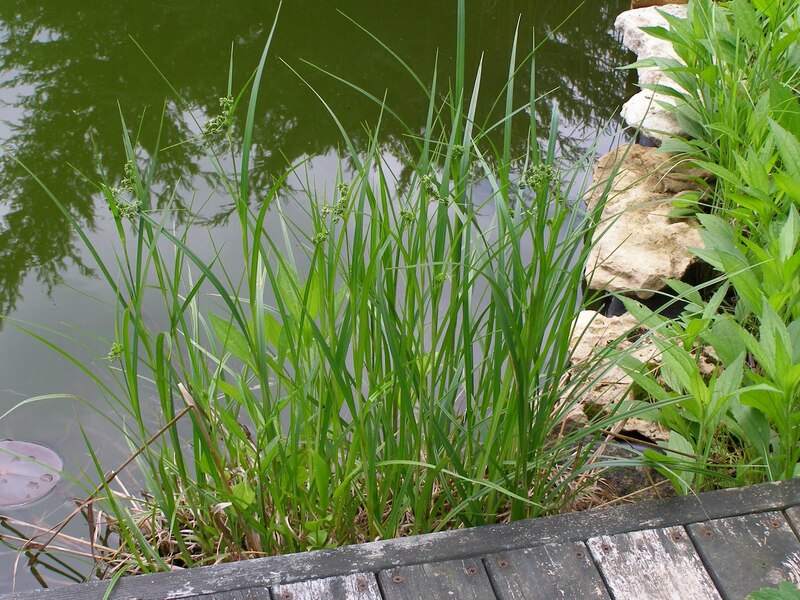 The remaining plants are those typical weedy species found in most lawns or flower beds. The percentage of natives increases each year. The dominant native species is the Orange Coneflower, an aggressive plant that tends to crowd out its neighbors. Each year it shoots up to about three feet tall and then flops over into the water. In one corner I’ve planted some species commonly found along the creek. Jacob’s Ladder forms an almost solid mat. Bluebells, in the lower right corner, have finished for the year and are dying back. Somewhere in the mass of Great Bulrush roots are three pots that held the original colonists. I usually remove the dead stalks after the ice melts, but this year there were salamander eggs on a couple of the stalks, so I left them alone. 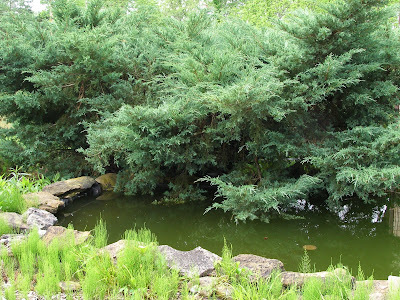 This juniper shrub was present in a much smaller form when I built the Water Garden. It was planted before I decided to landscape with all natives and was advertised to grow to a maximum height of four feet. Two years ago it was 13 feet tall. I’ve been cutting away at it a little at a time, trying to get it back down to a manageable size. I figured that it would do well here since the native junipers thrive. At least my assumptions were sound. As far as I can tell, Cardinals and Song Sparrows both have nests with young in there right now. I see the birds going in and out all day and hear the peeps of small birds.